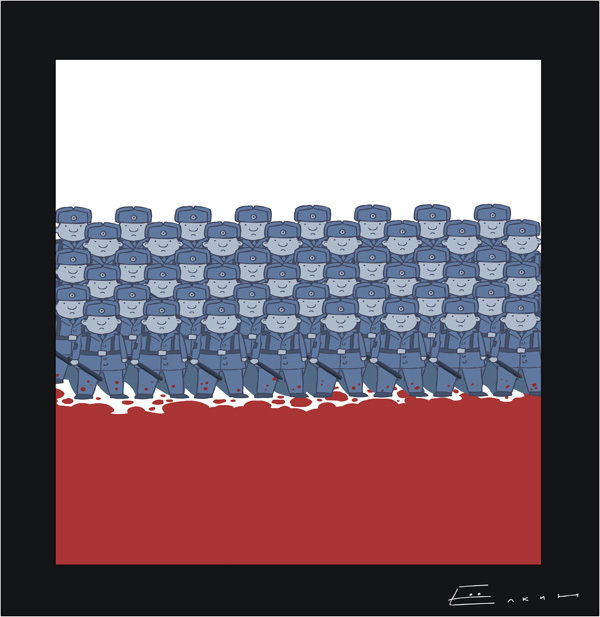 Prime Minister Vladimir Putin first floated the idea of creating the All-Russia People’s Front on May 6. A week later, the front’s founding document was published. Since then — a little over a month — Putin has arguably become the most popular politician in history. Today his front has several million supporters and about 500 organizations as members. According to information from the local branch of United Russia in the Khabarovsk region, half a million people support the front out of a total population of 1.34 million. In one day, 39,000 employees of the holding company Siberian Business Union joined the front; that is, four divisions in military terms, an apt comparison when talking about the people’s front. Putin, it would seem, has outdone Josef Stalin and Mao Zedong — and he has done it without resorting to terror. Russian Prime Minister Vladimir Putin cultivates the image of a bare-chested macho man, but a nun-like sect in central Russia thinks actually he’s the reincarnation of St. Paul, the apostle. Or, if not that, he may in a past life have been the founder of the Russian Orthodox Church. “I say what the Lord has revealed to me,” the sect’s leader, former convict Svetlana Frolova, said. Putin’s advisers disclaim any link with the sect led by the former railway manager, who was jailed for fraud in 1996. “He (Putin) does not approve of that kind of admiration,” Putin’s spokesman Dmitry Peskov said by telephone. A scene from the Rose Monday Carnival Parade in Dusseldorf, Germany, February 2009. Reuters. 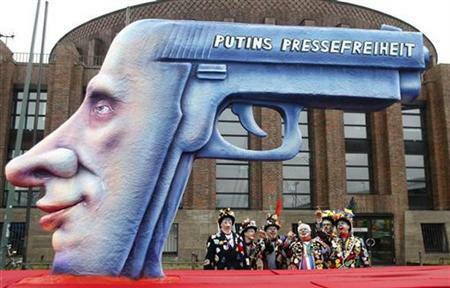 On the gun barrel is written Freedom of the Press Putin Style. Alexander Andreyechkin. Vladimir Litvinenko. Alexander Surinov. Do you know these names? If you don’t, you can’t claim to have any real understanding of Vladimir Putin’s Russia. Let us introduce you to them. Andreyechkin wants to ban Hotmail, Gmail and Skype from use in Russia. Want to see what somebody who would say something as venal as that looks like? Good luck trying to find a photo of him. Google images has never heard of him, but it’s not because he’s a nobody. To the contrary, Andreyechkin is the head of the FSB’s department for protection of information and special communication, and Vladimir Putin’s spokesman Dmitry Peskov, said that Andreyechkin was voicing the FSB’s official position. The FSB is the KGB, by another name. It’s hard to say which is more a more ominous sign for Russia: That the FSB is so brazen and heedless of its own history that it can openly call for shutting down basic communication services, or that it is so incompetent that doing so is the only response it can make to its helpless inability to deal with these evil foreign systems, which apparently are far too complicated for it to manage on its own.